My original due date with Tori was May 31st. I knew she would most likely be a June baby due to my previous babies being late, but I was not prepared to go 8 days over with my 4th baby. To say that I was uncomfortable and generally down trodden that last week would be an understatement. I cried every morning because I hadn't had the baby in the night and I cried every night because I hadn't had the baby during the day. We were also waiting to leave for North Dakota and couldn't really make any plans until baby arrived so I was stressed about that as well. On Monday June 8, 2015 I got up and decided that I was going to be happy no matter what. I made a double batch of chocolate chip cookies to take to my visiting teaching families. Michelle had been in town for close to two weeks waiting for the birth and we had planned to go swimming that afternoon at the Loveland's pool. It had been pretty hot which added to my end of pregnancy angst. Jason met us at the Lovelands that afternoon around 2:30pm. Right when we got there I felt like I was leaking. I thought "hmmmm that isn't normal." I told Jason and Michelle about it and then asked to use their bathroom. There was blood and I knew from Hadley's birth that this was the start of something. I had been having contractions on and off, but after this I noticed they were more consistent. I didn't swim for fear of leaking in their pool :) We stayed until about 4pm. Before we left I had Ashley Loveland take our family picture. 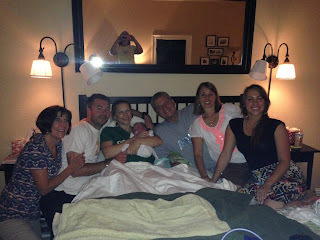 I knew I was in labor at this point and wanted a final family of 5 picture. By 4:30 I was still leaking and having consistent contractions that weren't close together and easily bearable, but they were increasing in intensity. Aunt Cheryl had offered to bring us dinner (before she even knew I was in labor, she is the best) and was coming to drop it off around 6pm. She got here closer to 6:30 and I was having a hard time focusing on our conversation when a contraction would come. 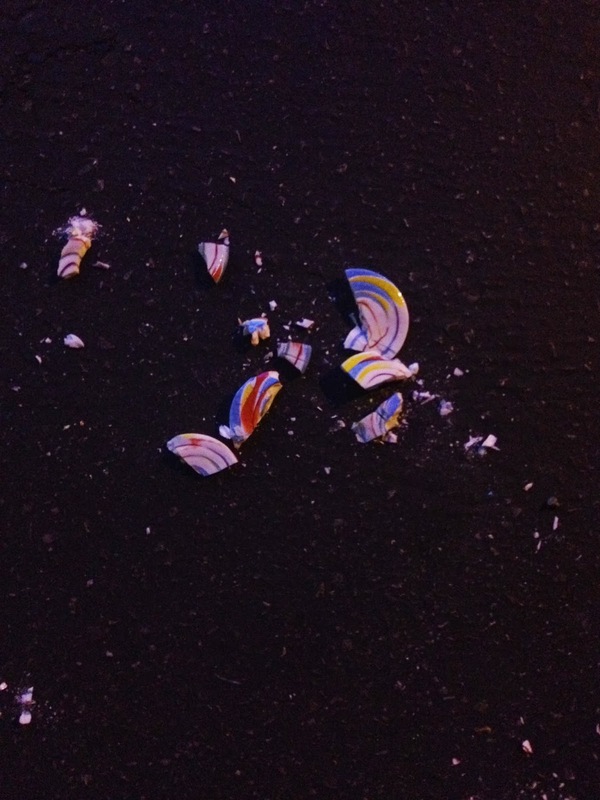 After she left I started calling/texting everyone to let them know that it was getting close. I looked back at my texts and at 6:36 I texted the midwives and they left their house 10 mins later. 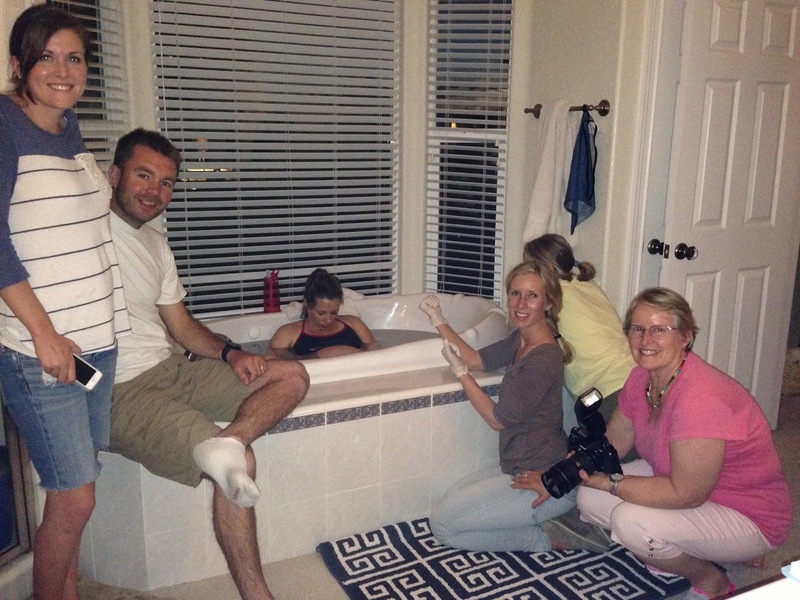 I'm not sure what time people started showing up, but by 7:30 the midwives, my mom and sister in law Michelle were here. Shortly after texting everyone I got into the shower and labored there for awhile. I had the midwives check me and I was 7-8cm. The amniotic sac was not cushioning the head this time like it was with Hadley so we left it intact. I got into the bath and spent the remainder of time there. I just remember thinking how similar to Hadley's labor this one was. It was dark by then. My dad was here with the boys and I think he and Jason tried to put them to bed but they were so excited and wanted to know when baby came. So they stayed awake. There was one point where the midwives had me feel the baby's head, Jason got to as well. It was so cool. When I started to feel pushy I got into the position I had used with Hadley, because I knew it worked. I started pushing and during one of the pushes I felt a "pop" and knew my water had broken. I was so excited to have experienced that feeling. Everyone there said they could see the "pop" in the water. I pushed SO hard because at this point things were intense and I was ready to be done. 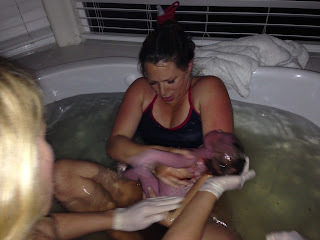 I pushed until her head came out, expecting to feel the relief had had felt with my previous births, it didn't come and I said "it still really hurts," which I didn't expect. I think because of that I continued to push long and hard until I felt that little body slip out. I reached down and brought baby up to my chest. I cannot explain the relief that comes in that moment. 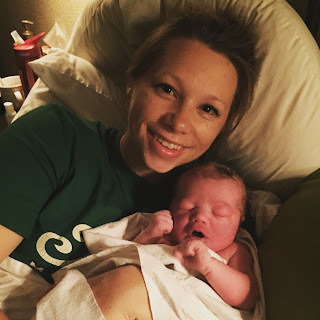 The baby you have been anticipating, and loving, and worrying about is finally here. It is the BEST feeling. Since we hadn't found out the gender the first thing I did was check. We were so excited to see it was a little girl. A sister for Hadley! I spent the next few minutes just holding her and trying to calm her, she wasn't happy to be out :) It must have been kind of traumatic for her because her little face was bruised from getting pushed out so quickly :( When the cord had stopped pulsing Jason cut it, and shortly after I felt the urge to push again and delivered the placenta. They boys came in and met their new sister. They were so excited. I got out of the tub and settled into bed. Tori pooped everywhere and after she was cleaned up we weighed her. 8lbs 8oz born 8 days late on June 8th. We have had the name Victoria picked out almost my whole pregnancy if the baby was a girl. Originally her middle name would have been Kate, but Jason has always loved Scout, so at the last minute I suggested Victoria Scout and we both loved it. Tori is now 3 months old and I am just getting around to writing this up. It shows how busy our lives have been. When she was two weeks old we packed up and left for North Dakota. 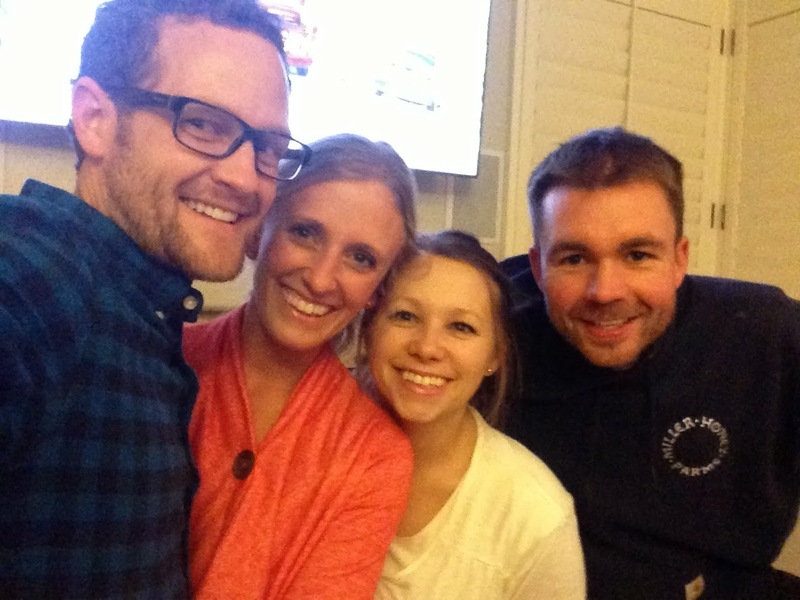 We all drove to Jenny's house in Lehi, and from there Jan, Hadley, Tori and I flew while Jason drove with the boys. It was busy. Tori has been the best baby. She goes with the flow and has been only getting up once a night since she was like six weeks old. She smiles at anyone who talks to her and she is starting to "talk" back.We love her so much and all agree that she was worth the long wait. 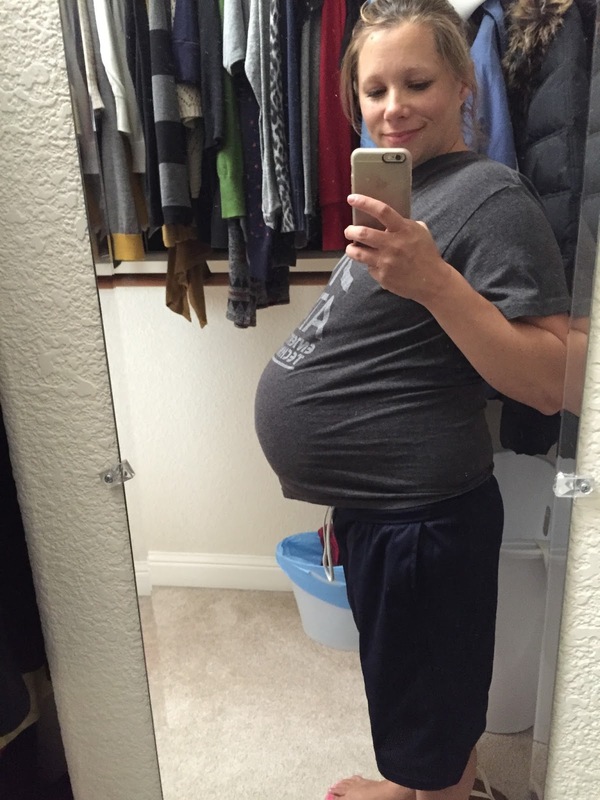 Last picture taken while pregnant. This was while I was in labor. 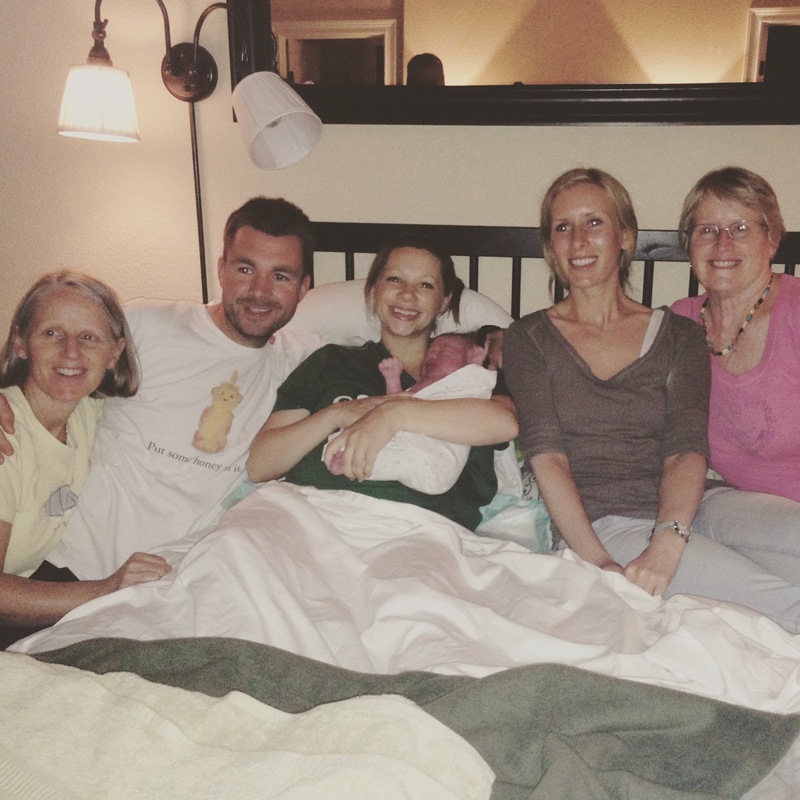 Everyone hanging out right before she was born. Checking to see, boy or girl? We didn't get a picture of everyone at the birth, but shortly after. Michelle was there and Jan and Letty were not. Kaleem, Christie and Marlene were my midwives and they are the best. 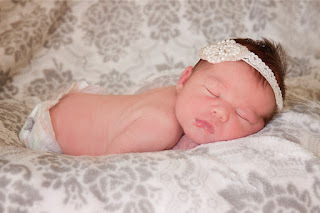 One of the pictures take of Tori when she was 5 days old. So sweet! 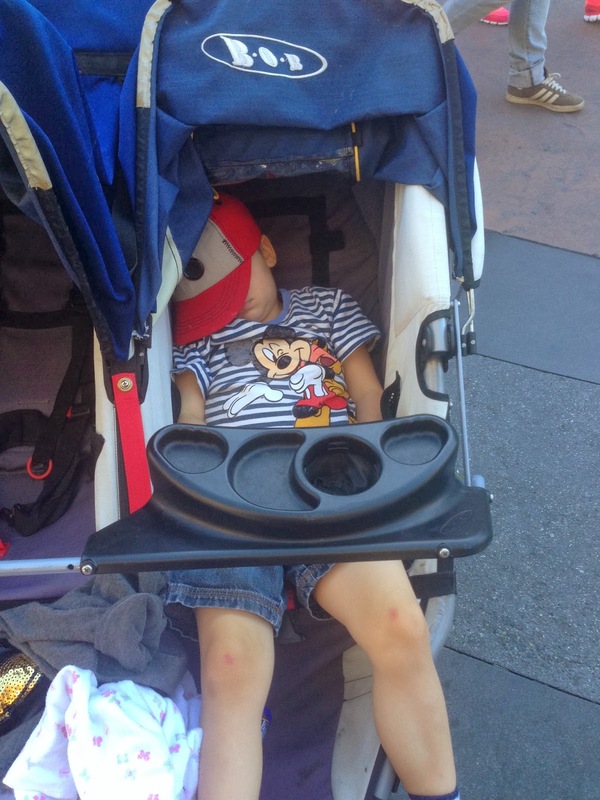 I have been anxiously awaiting the time where my kids would be old enough to take to Disneyland. It was a family trip that my family went on often and was a wonderful memory from my childhood, so I couldn't wait to take our kids. We had planned on leaving Sunday, but I convinced Jason that we should leave Saturday. We drove down to Valencia and stayed at a Best Western. We ate at a really yummy place we found on Yelp called Rustic Eatery, and afterwards Jason took the kids swimming while I got the baby to bed. I had been kind of sick with a fever on the way down and I didn't feel so well that evening. Hadley was up every 2-3 hours, so it was a pretty miserable night for me. We got up the next morning, had breakfast, and I took the boys swimming again. We then got on the road and headed to the Los Angeles temple. Ollie spelt out Disneyland with some wiki stix. We loved the visitors center at the temple. 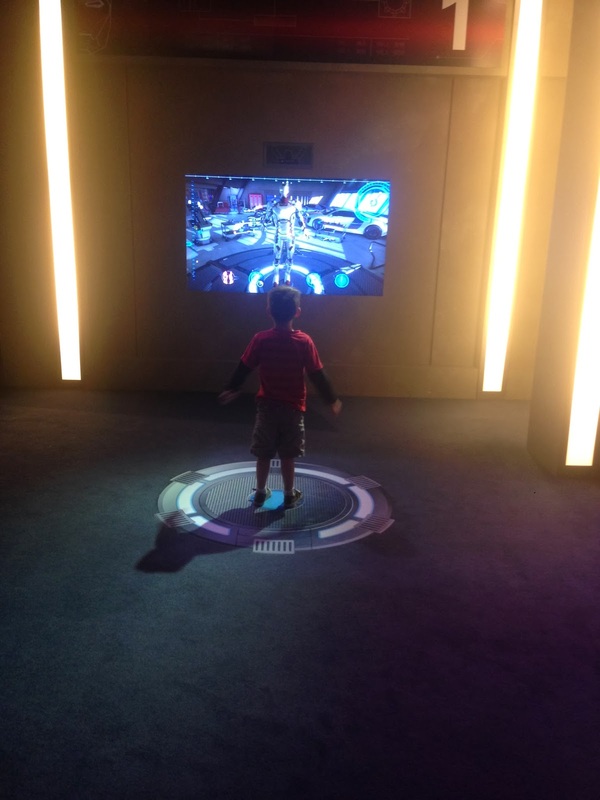 It was interactive and very cool. After that we headed down to Oceanside for dinner with our friends from Provo, the Henrys. It was so great to catch up with them. We haven't seen them for a few years, but we picked right up where we left off. Only difference is now there are six kids between us! 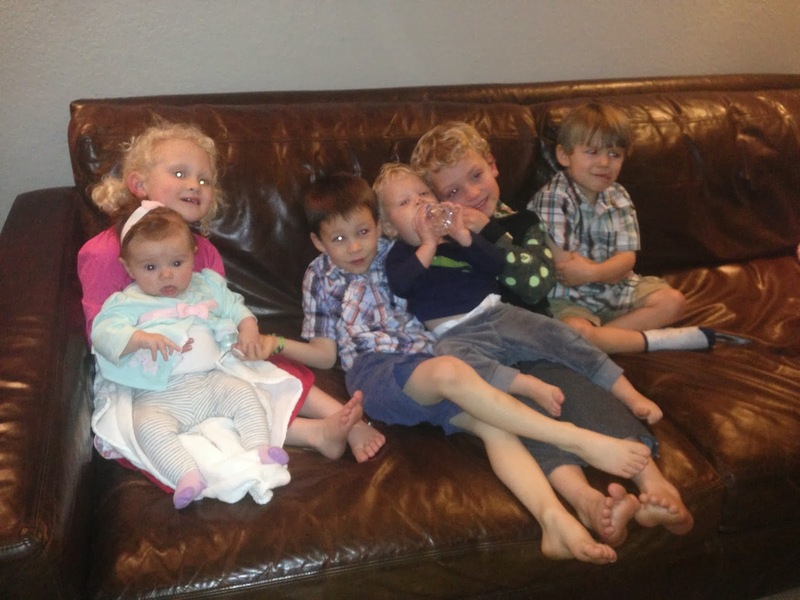 The kids got along great, we just had the best time with them. Scarlett was SO sweet with Hadley, it was adorable. Dan, Ashley, Jason and I. 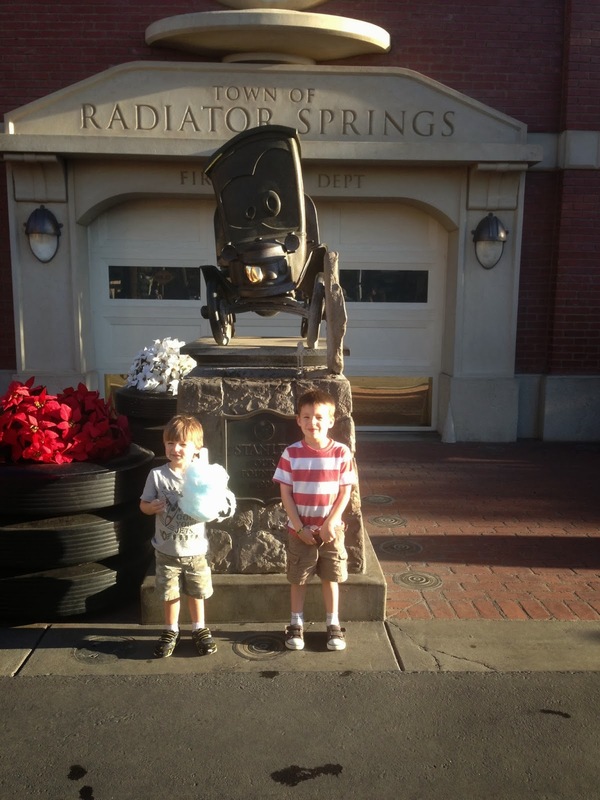 We got to our hotel (the Best Western RIGHT across the street from Disneyland), put the kids to bed, and then Jason ran over and bought our tickets for the next day. The park didn't open until 10, so we got up, had breakfast (hotel buffet) and headed over about 9:30. The park was a little busier than we had expected, but still not too bad. We never waited more than 30 minutes or so. 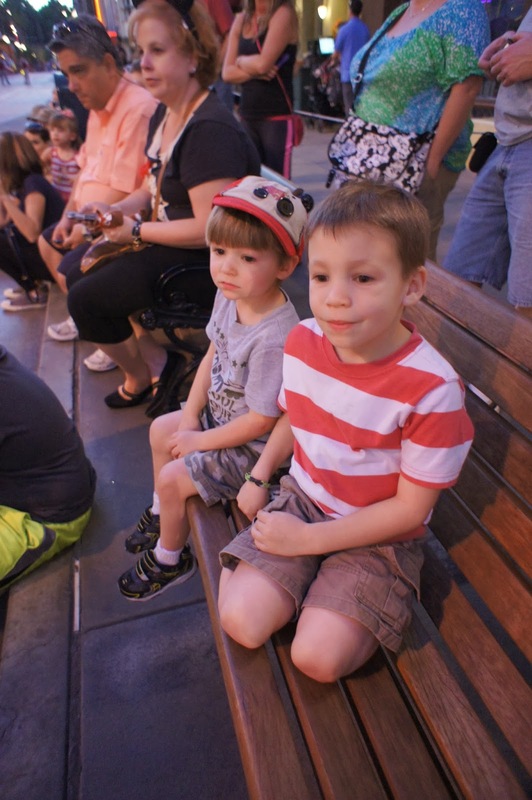 As we walked down Main St, the boys were in awe of everything. I took a couple pictures of them pointing at everything and saying, "look, look." Jason and the boys in front of Sleeping Beauty's castle. I took the kids on all the spinning rides since Jason gets motion sick. Ollie was kind of a scaredy cat on a lot of the rides, even the little kid ones. He got better as the day went on. I was so excited to see characters. I found the autograph book that I used for a couple of years as a kid, so we used the blank pages in that. Some of the Disneyland employees noticed how old my book was and were VERY interested in my signatures. 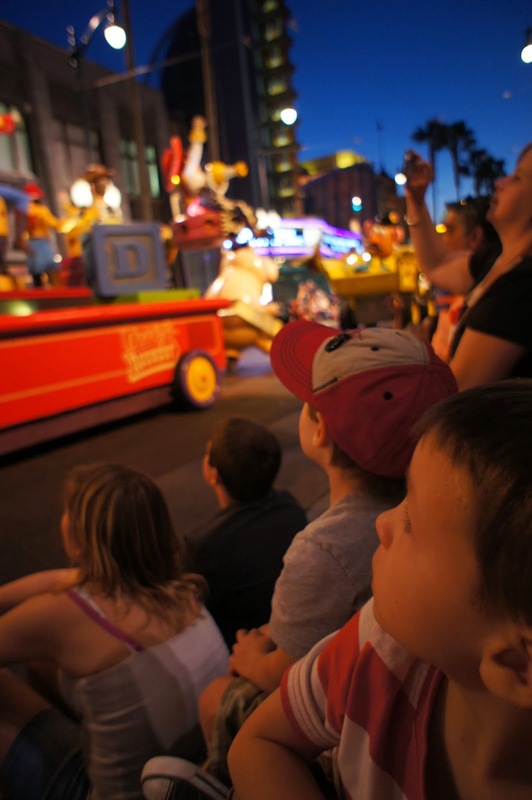 Especially since a lot of the characters are no longer at the park. 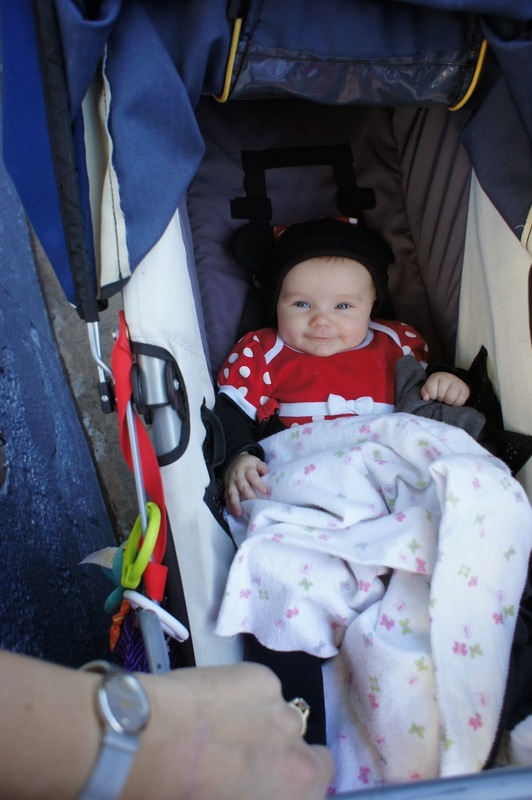 Mickey was REALLY cute with Hadley (maybe cause she was dressed as Minnie). He spent a lot of time playing with her and she just grinned at him the whole time. It was pretty cute. 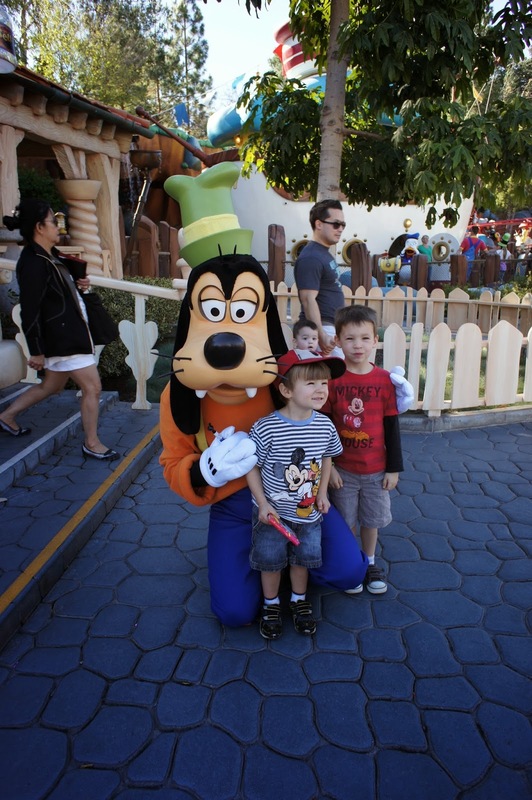 This picture ended up being one of my favorites since we are all looking and you can see the kids Mickey gear. Hadley was such a trooper. Max hardly ever takes naps, but he was worn out. I thought maybe he was getting sick cause he slept so long and said his tummy hurt, but he was fine. Ollie playing with the Ironman suit. 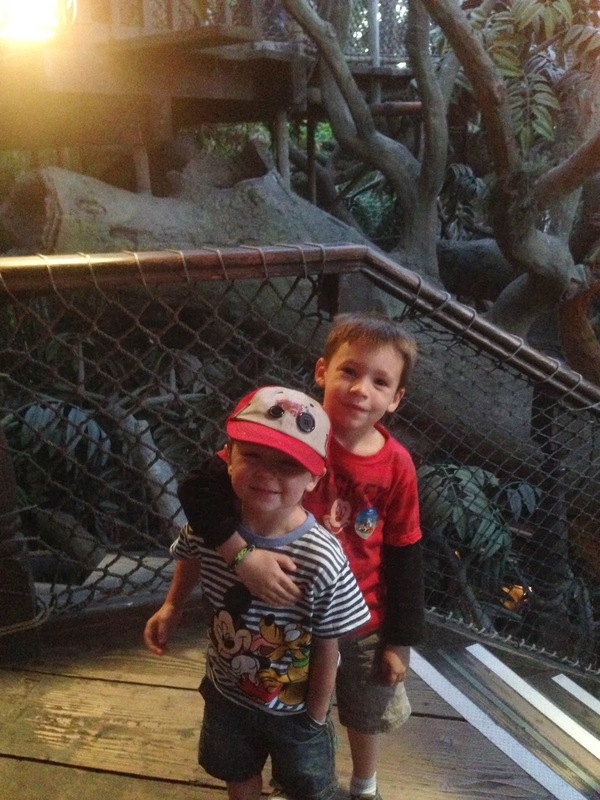 The boys loved running around Tarzan's treehouse. I love this view of Disneyland. Seriously so nostalgic for me. After Disneyland we headed to this pizza place near our hotel that had really good Yelp reviews. While we were there I saw a girl I went to high school with. In fact, I went prom with her brother my sophomore year. Kind of crazy. The pizza there was AMAZING, Yelp comes through once again! We ordered an extra pizza and took it into the park with us the next day since the food we had at Disneyland was expensive and terrible. 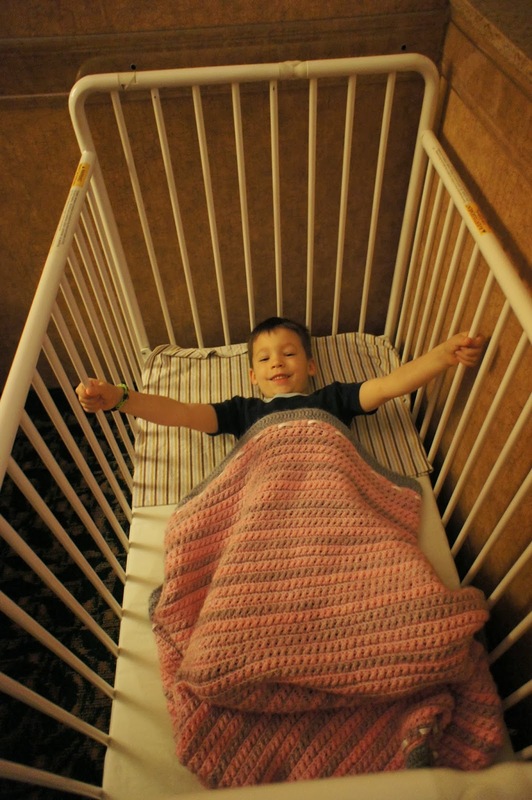 Our kids love staying in hotels. It is one of their favorite things about vacations. Ollie tested out Hadley's crib. This particular Best Western had a really good breakfast. Tuesday we spent the day at California Adventure. 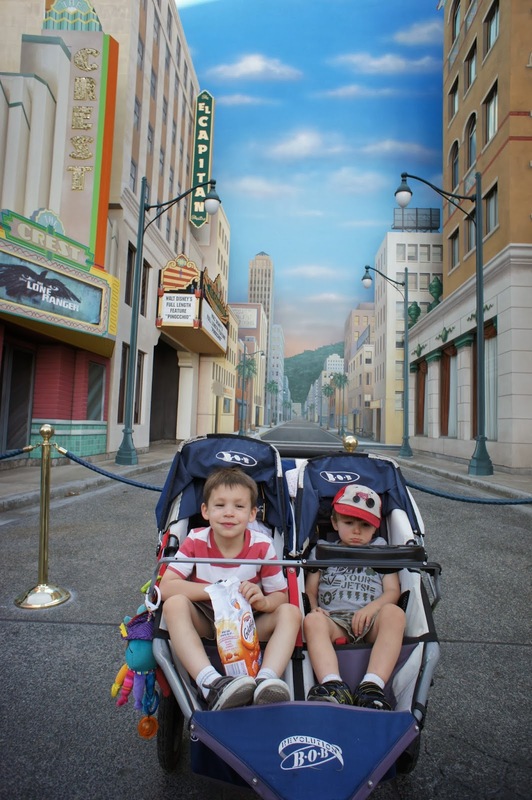 I think the kids liked it better than Disneyland because it has rides and characters from all the Pixar movies, which is what they mostly watch. Max made this face in every picture we took (unless we threatened him with some kind of punishment). Jason and I took turns riding the adult rides. I seriously love California Screamin'. I couldn't stop smiling. 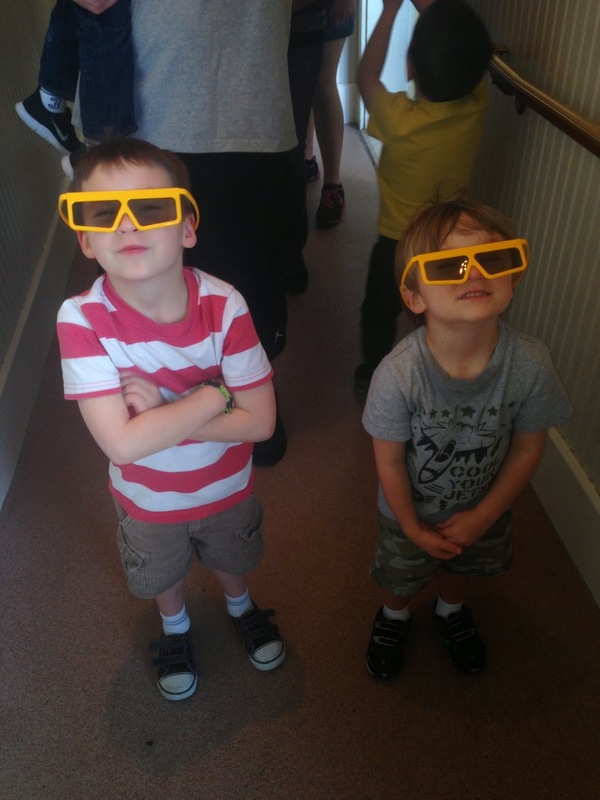 The boys loved the Toy Story ride. 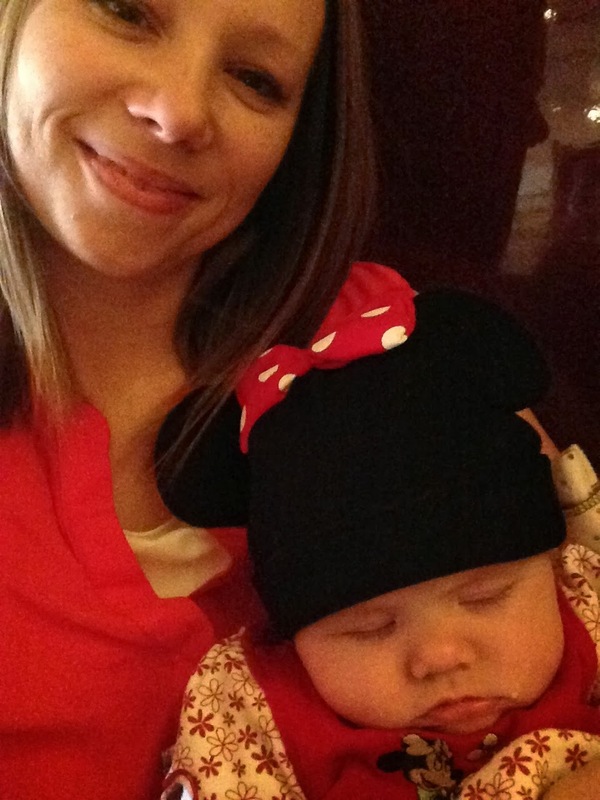 Hadley fell asleep during the ride. It was so warm that day. Probably around 80 degrees. It was so nice. 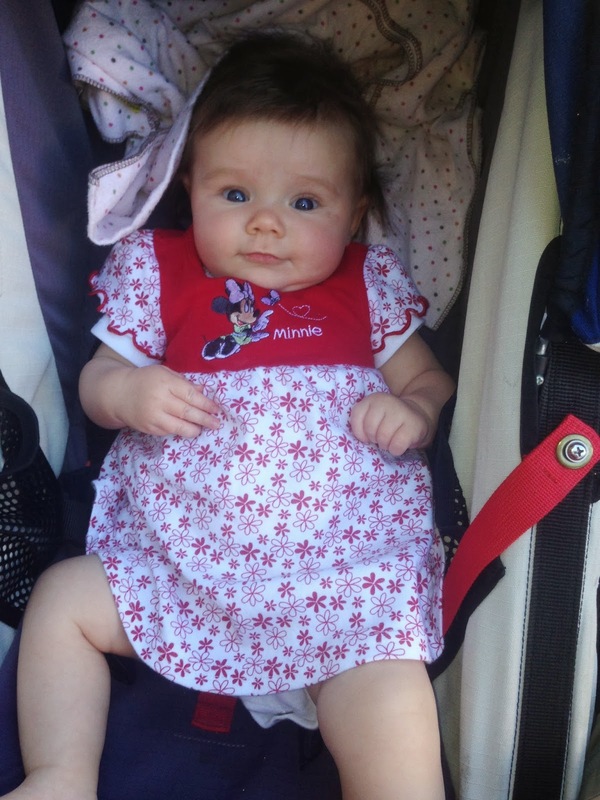 Hadley loved having her legs free of clothing. 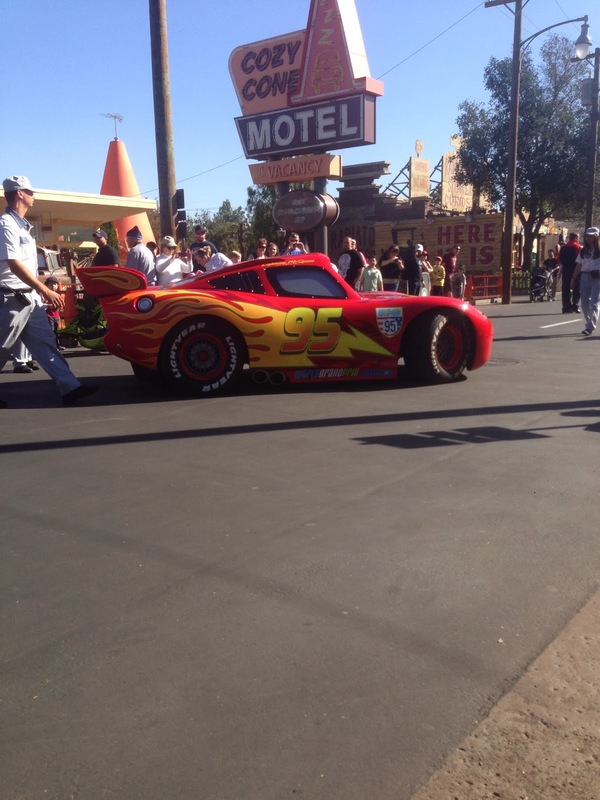 The boys were waiting to see Lightning McQueen when he left and Mater came. 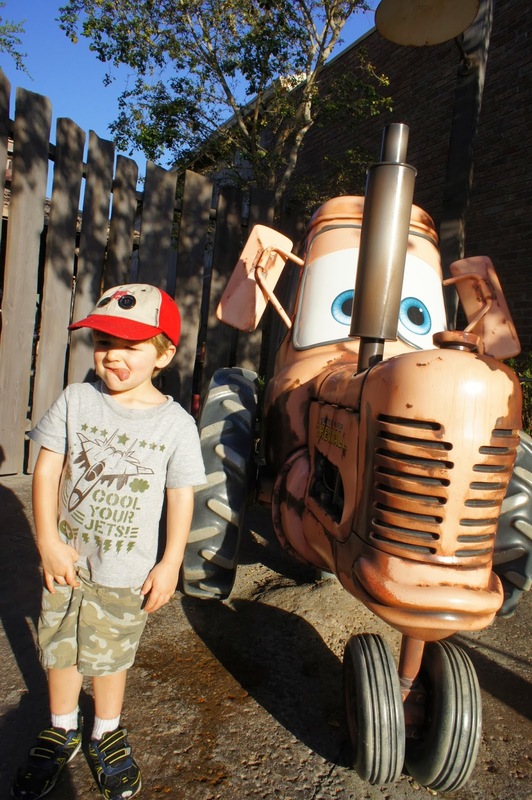 Jason said they were even more excited to see Mater. I snapped a pic of McQueen as he was leaving. 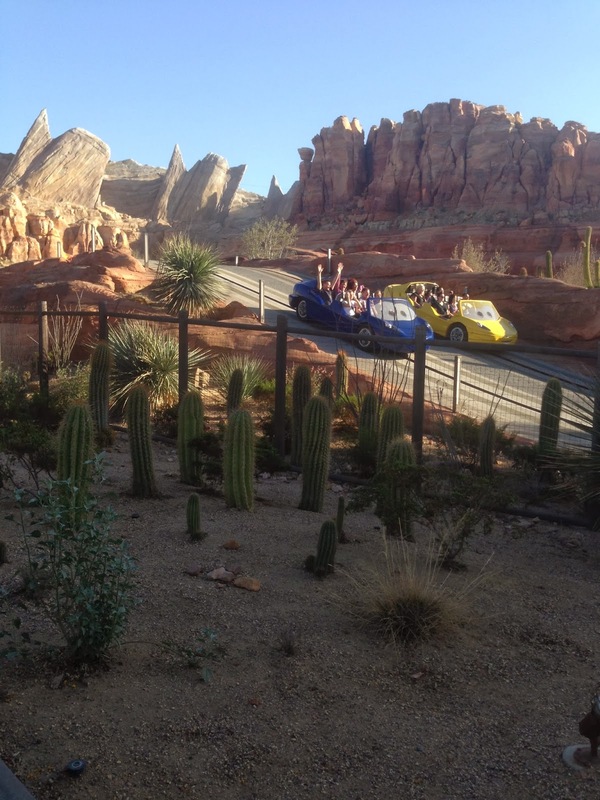 We had a lot of fun on Mater's ride in Cars Land. 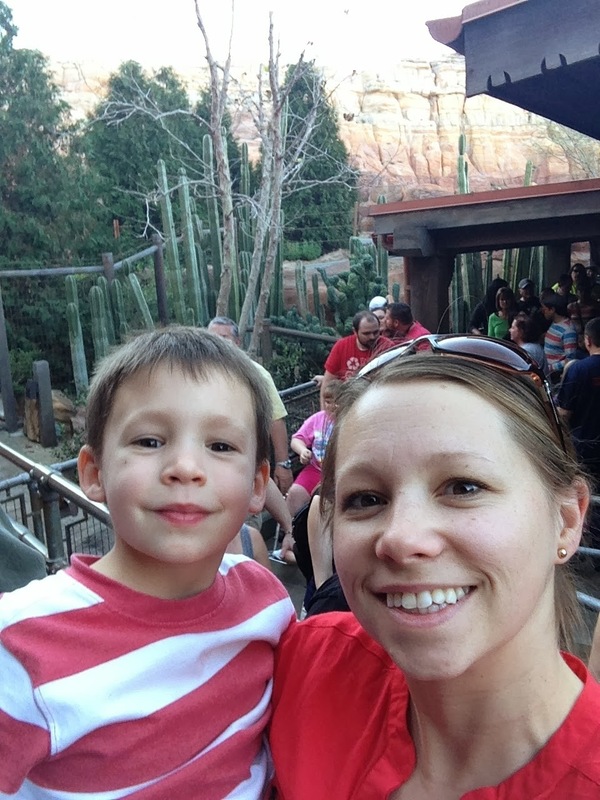 Ollie and I in line for the Radiator Springs Racer ride. We got fast passes for this ride so he got to ride it twice. We also ran into our friends Matt and Jamie Brasher and Gary, Jennifer and Conner Bowden. 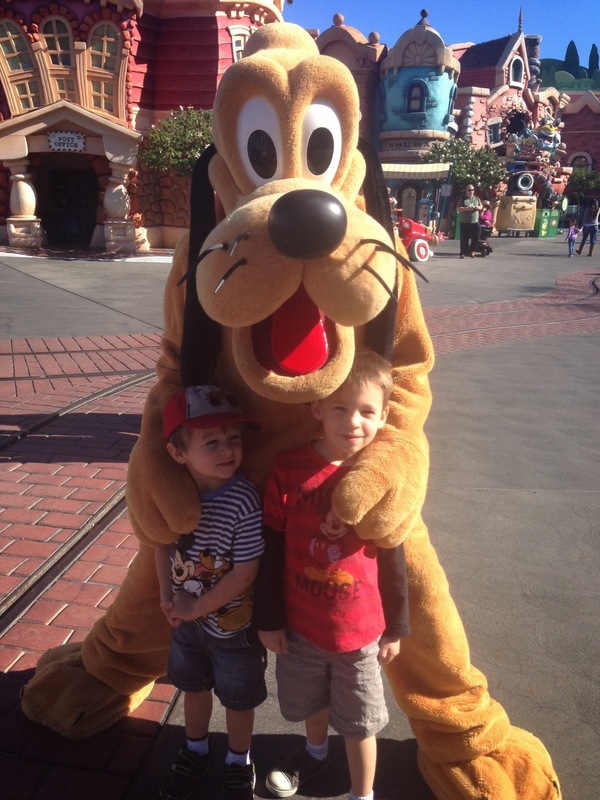 Ollie and Max in front of Stanley. Here we are waiting for the Pixar Parade. The boys loved it. 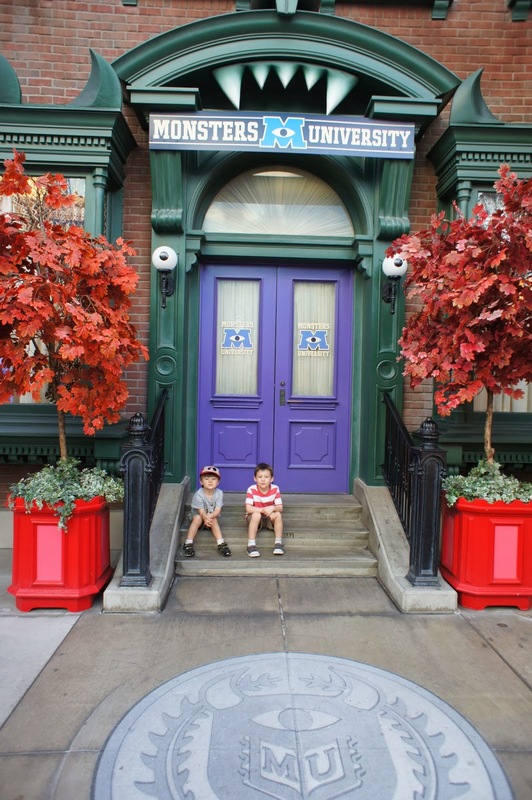 I think my favorite part of the whole vacation was watching the boys experience everything. It was awesome. After we left the park we headed to Fountain Valley to stay with our friends Chris, Lucy and Mathilda. It was so fun to catch up with them. Wednesday morning Jason and Chris went for a motorcycle ride and we took the kids to a park. Then we headed to downtown Huntington Beach for lunch. We headed out around 2pm to beat the LA traffic. Help Our Friends Adopt Again!